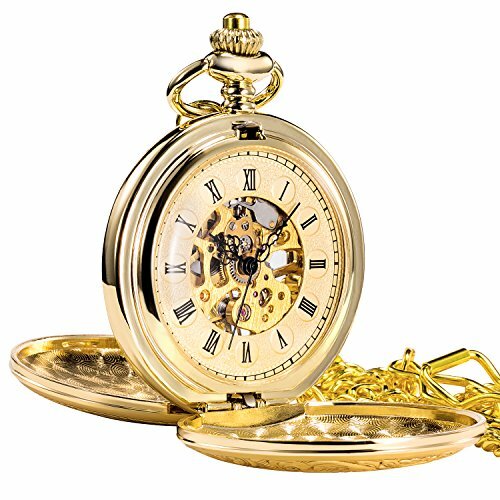 TREEWETO Antique Mens Pocket Watch Skeleton Mechanical Half Hunter Golden Case Roman Numerals | What Should I Say? clockwise rotation with 30-40 turns. The power will be full(Over winding will ultimately break the spring). Do this one time each day (before sleeping). Otherwise, it will stop working. Please do not over winding up the watch if you feel the crown is tight. 1. SPECIAL DESIGN - Elegant double hunter design, Golden engraved hollow case, Special skeleton mechanical dial with golden movement, gold dial with black Roman numerals. Looks very Elegant, Smart, Vintage and fashionable! 2. GOOD QUALITY - 100% brand new with excellent workmanship, Precise mechanical movement, Elegant case with long chain, Good touch feeling. Fit for casual environment and business occasion. For safety, the front face is made of Acrylic instead of Glass. 3. BRTTERY NEEDLESS - Mechanical hand-wound movement, No need to use battery. Twisting the top button on the spin, tightening a walk for 24 hours. Please wind up the watch before every usage, Keep the watch away from magnet to avoid making the watch stop working. 5. PERFECT CHOICE - Comes with good quality gift box. Perfect gift for your love and family or yourself, Best Valentine Gift, Superb Christmas Gift, Birthday Gift, Wedding Gift etc. If you have any questions about this product by TREEWETO, contact us by completing and submitting the form below. If you are looking for a specif part number, please include it with your message.